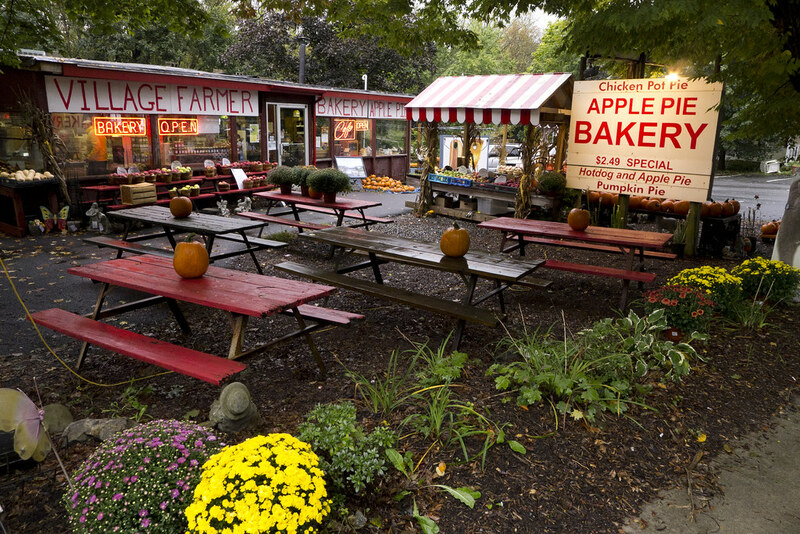 From the outside the most intriguing thing about Village Farmer Bakery in Delaware Water Gap, Pennsylvania, is the large sign depicting a hot dog and slice of apple pie holding hands standing over the words, "True Love!" Holes are cut out at the top of them, so you can stick your face in for a photo op. When I saw the inside my face lit up like Charlie walking into Willie Wonka's edible Chocolate Room. There are so many delicious things in this building it overwhelms the senses. Well, at least to someone with a thru-hiker appetite. Thru-hikers talk about food more than anything else. We need 5,000 calories per day, so are always hungry. We describe every food we happen to be craving like we suddenly all work for Bon Appetit Magazine. Even tiny morsels become important. One day, I saw two M&Ms in the dirt and mumbled something about the damn day-hikers leaving food on the ground. "How do you know they're from day-hikers?" Red wondered. "Because a thru-hiker would have picked that back up out of the dirt and eaten it." Hell, I even thought about eating it. At the beginning of this trip, we all underestimated how much food we would want to eat. In the 100-Mile Wilderness in Maine I was so hungry I licked the insides of the flavor packets from my Ramen Noodles to get every calorie. And I overheard Thumper say to Sixgun, "Are you going to throw away that Cheerios dust?" "Yeah," she replied. "Do you want it?" "Uh yeah, that's second breakfast." So yes, we love food out here. If you're curious, I just bought a Boston Cream Pie (to share with Deuce and Brother), some cookies for my next stretch of trail, and their famous $2.49 combo, a slice of apple pie and a hot dog. Mmm, together at last.